This book has a wonderful and rewarding explanation of how to get anything you want out of life. This is the definitive edition of the timeless classic about attaining health, wealth, and success. Complete and unabridged with footnotes and biography of Charles F. Haanel. 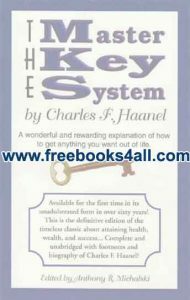 In this book the readers will read Introduction to The Master Key system, The basics of your mind, Realizing your mental resources, Reversing the process â€“ from cause to effect, The creative mind, The brain of man, Utilizing the omnipotent power, Thought and itâ€™s results, Affirmations and your mind. A certain definite cause, Inductive reasoning and the objective mind, The power of concentration, The dreams of the dreamer, The creative power of thought, The law under which we live, Gaining spiritual understanding, Symbols and reality, The law of attraction, Your mental food, The spirit of things, To think big thoughts, Spiritual seeds, The law of success is service, Alchemy, Questions and Answers and much more in this book.